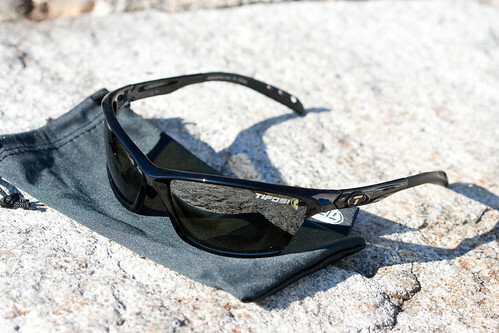 We will be having a look at the interchangeable lens Ventroux sunglasses from Tifosi Optics today. Delivered with three different style lenses, these sunglasses are as versatile as they are stylish…and you will still have some cash left over to actually play some golf! The Tifosi Opticsâ„¢ ECâ„¢ lens is designed for athletes seeking an edge in distinguishing terrain details. The ECâ„¢ lens blocks 100 percent of UVA/UVB rays while increasing light contrast by filtering the blue light spectrum that is responsible for optical blurring and decreased contrast in bright light conditions. This Italian-designed and manufactured lens is ideal for spotting the subtle breaks of a putting green or the lines of your local single track. The Tifosi Opticsâ„¢ GTâ„¢ lens features â€œobject illumination,â€ which enhances your ability to pick up a ball in flight by providing a balance of target and background brightness. The spectral tint of the GTâ„¢ lens is for â€green grassâ€ conditions. Whether you are at the tee, lining up to putt, or at the net, the GTâ„¢ lens is designed to help keep your eye on the ball. 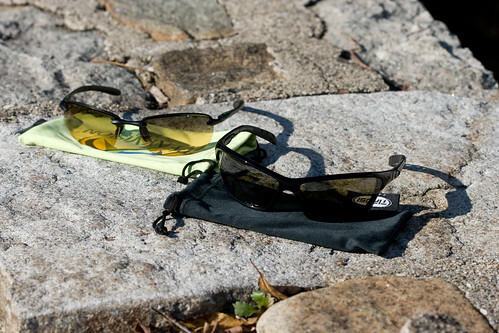 Tifosi Opticsâ„¢ is excited to introduce a new injected polycarbonate polarized lens family for 2006. These new lenses offer exceptional strength compared to acrylic polarized lenses and superior optics to traditional polycarbonate lens. Tifosi Opticsâ„¢ new polarized lenses are injected at high pressure to increase optical clarity and decentered to eliminate distortion. The result is a shatterproof lens that reduces glare and offers unsurpassed optics. You can read plenty more about the specific technology in the Tifosi sunglasses on their Technology page. They will tell you all about the nitty gritty details…like the Hammer Test. No, I did not try to recreate that test…as much fun as it may be to smash one’s sunglasses with a hammer…I wasn’t about to try it out. I’ll take their word for it! These sunglasses are pretty stylish, and I wouldn’t mind actually wearing them around off the golf course. The simple black frames, have nice lines to them. Being about 6’4, I have a rather large head, so sunglasses are sometimes hard to fit. This particular model fits well across my face, however, the part that goes over your ears is a little short. So that makes them somewhat uncomfortable for me. But unless you have a huge noggin (it’s like sputnik! ), these will probably feel quite comfortable. They do feel a little heavier than the PeakVision sunglasses on the face, but being plastic they are quite light. The plastic part is one thing that bothers me a little. They do feel a little delicate. However, I have worn them a LOT over the past month, both on and off the golf course, and they have held up to a lot of abuse. Besides at this price point you cannot expect metal frames. One plus of the plastic…they do not get ice cold sitting in my car over night! One of the great performance features of this product is the ability to swap out lenses. Sure you can do this with glasses from other companies as well, but Tifosi actually provides you with three options out of the box. In my particular sunglass kit, I received the GT, EC and AC Red lenses. I played golf with both the GT and EC lenses. I preferred the GT lenses, as it was pretty easy to pickup the ball in flight or find the ball in the rough. The EC lenses were a little dark for me on the course. The EC lenses claim to help you notice subtle breaks on the green. Perhaps in the summer time, I actually had to take them off to putt at this time of year. So we’ll have to revisit this when the sun is a little higher in the sky. The GT lenses, I felt comfortable wearing most of the time. Though, with the Ventoux frames, the frame comes around below your eye, so it is a little distracting when swinging and putting. So I had to take them off while doing that. 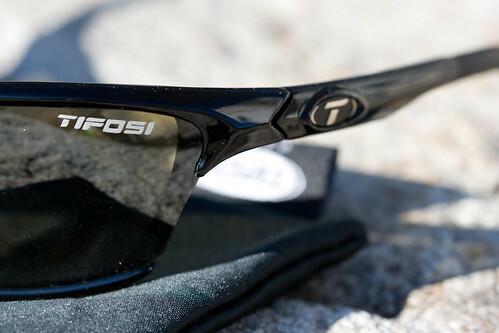 Some of the other Tifosi golf frames may be a better option for those of you who like to wear sunglasses while swinging. I had tried out the AC Red lenses while driving, and while they were pretty nice for cutting out glare from the pavement…something about them didn’t agree with my eyes. They actually gave me quite a headache. So, I tried out the EC lenses while driving, and to my surprise, they were quite nice. Signs and lights really jump out, and there is enough tint to them to cut out some bright light. Though, in the summer time or when there is lots of snow out, I would prefer polarized lenses to really cut down the glare. 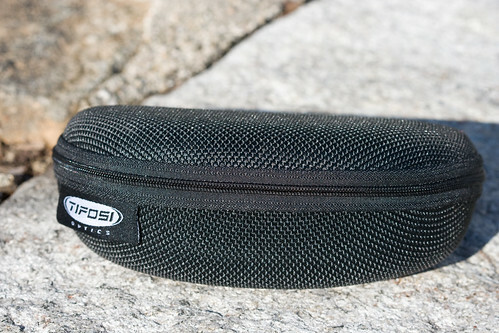 As you can see above and below, the Tifosi glasses come with a great little protective carrying case. The hard case is very solid and I would think would do a great job of protecting your glasses be it in the car or in your luggage. 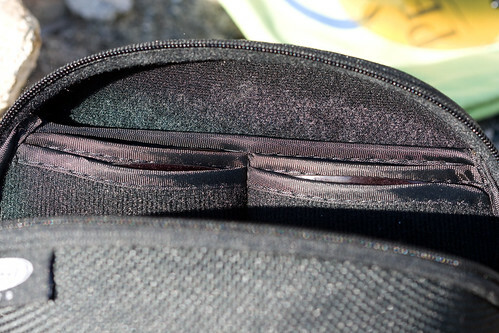 The inside of the cases (as you can see below) has a few little pouches to store the spare lenses. You can fit 2 extra pairs of lenses in there. Switching lenses was a little difficult at first, but once you get over the fear of breaking the sunglasses, it is quite easy actually. I’ve swapped them in and out a dozen times now, and I have no problem. The lenses sit in the frame very firmly as well, so there is no worry of them falling out or anything. With a lifetime (limited) warranty, you are protected against product failures outside normal wear and tear situations. One neat thing is, if you scratch up the lenses, apparently they will replace them for you for $10. “Tifosi Opticsâ„¢ will replace lenses from its Interchangeable family damaged for any reason, such as scratching, for a shipping and handling fee of $10.00 per lens pair.” Outstanding! I would say if you are loaded, and money is not a concern, go for the PeakVision glasses. I liked the lenses on the PeakVision a little better. However, if you are on a budget, or just are not willing to spend $150+ on sunglasses, the Tifosi glasses are a great option. 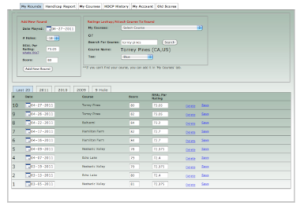 You can put that extra $100 aside for a couple extra rounds on the links. 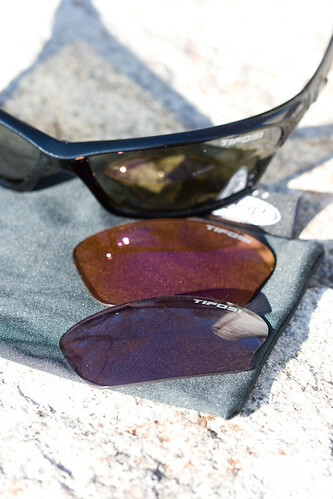 The Tifosi Ventoux sunglasses can be had for a retail price of $59.95. Be sure to check out eBay as well.